Searching for a Professional Home Appraisal in the Houston Fifth Ward Area? Our Texas certified appraisers are the top providers of independent residential and commercial real estate appraisals in the Fifth Ward area. Our goal is to provide our customers with a fast, reliable and professional appraisal service that meets or exceeds their expectations and requirements for use. Our appraisal fees are extremely competitive and we are known for having some of the fastest appraisal turn times in the area. All of our appraisers are Houston area natives and have over a decade of experience in the market area. We employ appraisers capable of completing all assignment from residential, commercial or mixed-use. If you have a commercial property assignment, most of our Texas Certified General appraisers hold the MAI designation from the Appraisal Institute and serve a large portion of South East Texas. We take pride in offering real estate appraisal services for any need including lending, private use, insurance and legal issues. Be it homeowners or industry pros, our promise to you remains the same – to deliver a reliable and friendly appraisal service. Should you’d like to go over your appraisal requirements in more detail please connect with us via the number on this page or the online contact form found above. 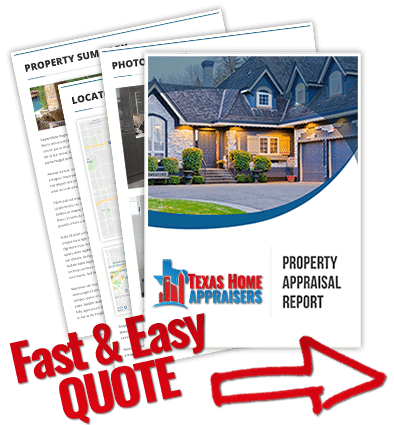 If you require a public real estate appraisers in Houston Texas to carry out a quick and friendly appraisal for your house, give us a call today or fill out the fast web quote form. I have the biggest home in the area. How will that affect me? Not necessarily. The appraiser will consider all relevant real estate data in the area. But when analyzing other recent sales, the appraiser generally will look for the homes most comparable to yours in terms of physical characteristics and the appeal of the location. In other words, the sales in your neighborhood might not make for the best comparisons if those homes are significantly less appealing. The appraiser may determine that the best for comparison home sales are in another neighborhood. Why are new homes selling for more than resales in my area? My neighbor’s house in a dump. Will that hurt my value? This depends on your definition of “bad neighbor”. If a house next to yours is in disrepair, it could impact the desirability of your home in the eyes of a potential buyer. Appraisers must take these things, known as external obsolescences, into consideration when valuing a property. But the truth is, it will be very difficult for the appraiser to place a dollar amount on this feature, meaning they may only note it within the appraisal report but not actually deduct value.